Sunflower oil is, as all fats and vegetable oils, a triglyceride (ie. a skeleton glycerol attached to three fatty acids by ester bonds). 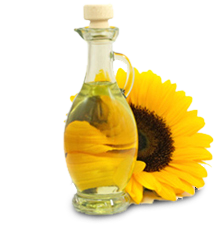 Sunflower oil is characterized by a high proportion of linoleic acid (40-68%) and oleic acid (22-50%). Other fatty acids present in significant amounts are: palmitic (7.5%) and stearic acid (3-5%) acid. This oil is obtained by extracting the seed of sunflower (Helianthus annuus), a plant from the Americas (North and Central America specifically), although nowadays it is intensively cultivated worldwide due to the potential and use of this oil. Sunflower oil is a pale yellow liquid at room temperature. Its melting range is between -16 and -18 ° C.
Among its many applications, and as the vast majority of fats, it emphasizes in human consumption. Sunflower oil is an important source of energy because of its high performance in calories metabolized per gram. Its most important and renowned use is in the kitchen, mainly as a frying oil and / or grill. Other important applications converge at different areas such as in medicine or cosmetics industries. Moreover, derivatives are also rather used as alternative fuel oils (biodiesel), soaps, lubricants, surfactants, advanced detergents, paints, insecticides, veterinary, among many others. Sunflower oil is one of the most important of our oleochemicals industry due to the multiple applications and functions it has. The oleochemicals are a means of great use in various industries becoming a big competition for chemicals due to the efficiency and quality of substances of natural origin. As finished formulations and chemicals, oleochemicals are a fairly cost-effective, not only economically, but profitable to solve all kinds of needs. The great development of the oleochemical industry has led to the globalization of our industry establishing itself as one of the most profitable alternatives and valued in recent years. The scarcity of oil and other supplies has led to the search for new more affordable and environmentally friendly to further develop all kinds of products and materials resources. Oleochemical born as an answer to this latent need of establishing itself as a means exponential value. The wide range of possibilities of sunflower oil is quite large because of its many properties allowing its adaptation and use in different and industrial areas. Our products are quite demanding and meticulous processed so it could make the most of each and every one of the possibilities that are requested on the market. This product can occur in 180 Kg. drums, 850 kg. containers or bulk tanks. For more information please contact us by telephone or via our online form.